Can emotional intelligence be taught? Marc Brackett, director of the Yale Center for Emotional Intelligence, thinks so. Understand the causes and consequences of emotions. Know how and when to Express their emotions. One of the most interesting insights from his and others’ research is that young children benefit greatly from the L part of RULER: Labeling. 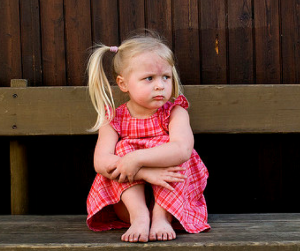 Preschoolers are at an awkward stage of life: Their capacity for having feelings is more advanced than their capacity to regulate them. Labeling is a powerful coping strategy. Studies show that labeling a negative emotion helps you to regulate (that is, calm down), while labeling a positive emotion reinforces it. I remember one of my own daughters was prone to fits of frustration and rage when she was about four. She’d yell and scream and throw things and sometimes thrash about it in a way that broke my heart. I so wanted to help her calm down, but I didn’t know how. Knowing what I know now, I would have helped her label her feelings. John Medina, the author of Brain Rules and Brain Rules for Baby, was clever enough to do this with his own son, whom he describes as being easily able to conjure up “Richter-scale” tantrums. “There they were, just as the research literature said: the powerful calming neurological effects of learning to verbalize one’s feelings,” Medina concludes. You can use labeling in a crisis when your child needs help calming down. You can also use it proactively to help your child build emotional vocabulary and resiliency before all hell breaks loose. The next time your child is angry or frustrated, label it. Rage? Fear? Joy? All are worth labeling! Show your child this image. Explain to your child that emotions have various levels of pleasantness and energy. The yellow emotions are pleasant and high energy, while red emotions are unpleasant and high energy. Blue emotions are unpleasant and low energy, while green emotions are pleasant and low energy. Talk to your child about names of other emotions, such as “frustrated” and try to put them in the correct part of the diagram. You might ask your child to act out the emotion. If your child wants more, you can carry this a step further. GreatSchools, an education website, has worked with the Yale Center for Emotional Intelligence to develop simple worksheet versions of the Mood Meter geared to children from preschool through fifth grade. It can give the two of you an opportunity to label and discuss emotions more deeply. For an introduction to Marc Brackett and the work of the Yale Center for Emotional Intelligence, see this video. John Medina, Brain Rules for Baby, p. 206. 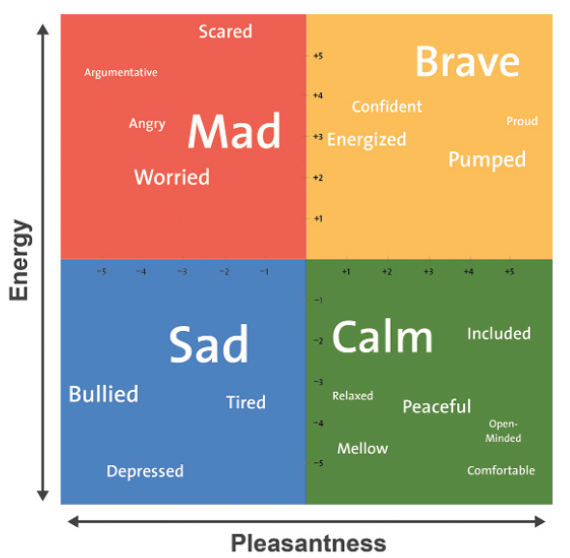 This version of the Mood Meter is found in an article published on the website of the National Association for the Education of Young Children: Teaching Emotional Intelligence in Early Childhood, Shauna L. Tominey, Elisabeth C. O’Bryon, Susan E. Rivers, and Sharon Shapses, March 2017. Parents can do this too, for themselves and to model it for kids. Labeling emotions is part of Mindfulness Based Stress Reduction. The act of labeling (not judging, just identifying) is proven to reduce negative emotions and reinforce positive ones. That’s helpful at all ages!